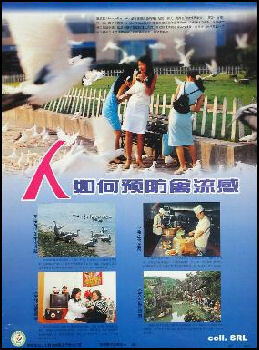 Bird flu prevention poster As of March 2008, there were 20 confirmed bird flu deaths and 379 people had contacted bird flu in China. At that time and 239 had died of the disease worldwide, with most of the deaths in Southeast Asia. China has been blamed for being the source of bird flu, a charge that officials in China have vehemently denied. A study published in November 2006, reported that the strain of bird flu found in most of the poultry outbreaks and some human cases in southern China?H5N1 Fujian-like?was also the primary strain found in Hong Kong, Laos, Thailand and Malaysia. How the bird flu is spread to humans is still not known. Most access is believed to be related to contact with sick or dying dead poultry. But scientists are not sure whether it is picked by touching the birds, or eating or inhaling dust contaminated with their feces. The disease is believed to have been spread to humans by contact with the dust of feces or saliva of sick birds. No one ever caught the disease from eating meat with the virus, which is killed if meat is cooked at 75̊C or higher for a minute. The Center for Disease Control has called bird flu a “ticking time bomb” especially if human-to-human transmission begins to take place. Bird flu can spread through the air as well as in feces. If there is human pandemic some estimate that 180 million to 360 million would die. Modern transportation and travel make the spread of such a disease easy and containing it once it starts impossible. Bird flu is a nasty disease. It causes the capillaries to leak blood and the immune system to overreact by producing excessive amounts of white blood cells and fluid. Chickens that catch the disease swell and hemorrhage and often die as bloody heaps within hours after catching it. The disease can be just as destructive to mice, tigers and other mammals. H5N1--the strain that causes bird flu in humans--is incredibly deadly. It has killed 75 percent of the people who were known to have been infected. Symptoms of the disease vary but generally included fever, coughing and eventual pneumonia. Some people have no symptoms or are mildly sick. The contagious form strikes victims quickly and has a nearly 100 percent fatality rate. The virus can change from being a low-risk strain to a high risk one through genetic mutation in the body. Human victims fight for their lives as the disease destroy their lungs and causes a massive inflammatory reaction. Healthy tissue dies and blood vessels leak, Many victims literally die of suffocation from the excessive fluid in their lungs. One victim was found with healthy lungs, Instead he died in a coma after his brain became inflamed. Most flus have two proteins, hemagglututinin (H) and nuramnidase (M) on their outer shells that act like hooks and allow them to invade other cells. Together H and N provide the virus’s chemical appearance and identity to the immune system. There are 15 forms of H and N proteins in the most populous class of flu viruses---influenza A (less common and less dangerous influenza B has only one type of H and N). Strains are identified with H and N protein numbers. The strain that causes bird flu in humans is H5N1. When a virus with a new H-N combinations appears immunity to old forms of the H-N viruses don’t work. People were encouraged not to eat potentially sick birds. Not because there is a danger of contacting the disease from eating (little chance of getting it from well cooked meat) but from preparing it. Trials have been conducted with a H5N1 vaccine. In February 2005, Chinese scientists developed a bird flu vaccine for poultry and mammals. bird flu prevention measures In early 2004, China reported 49 confirmed cases of H5N1 avian influenza (bird flu) during an Asia-wide epidemic of the disease. The first cases---among ducks in Guangxi Province---were reported in late January. The government moved aggressively to combat the disease---culling 9 million chickens and quarantining farming areas---and declared it “stamped out” by March. No cases of human transmission were reported. In June 2005, wild birds with bird flu were found dead at Lake Qinghai Nature Reserve in Qinghai Province, an important transit area for 189 species of migratory bird Thousand of wild birds---including bar-headed geese, cormorant and black-headed gulls---came down the with the disease. It was the largest known outbreak among wild birds Some thought migratory birds were the source. Others think the disease was brought to region from live poultry based on the fact that such a large number of birds would not have been able to fly to the remote region if they were sick. People were barred from entering the region Three million domesticated birds in the area were vaccinated. During the outbreak the government took strict anti-flu measures. Millions of chickens, ducks and other poultry were killed; poultry markets were closed down; and shipments of poultry were inspected nationwide. Roadblocks were set up outside infected areas and vehicles were required to drive over corn starch sprayed with disinfectant. 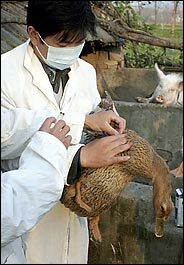 In May 2006, bird flu was discovered in a dead goose Qinghai Province in northwestern China. 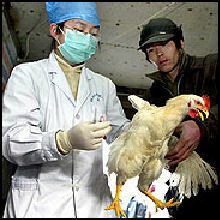 In July 2006, bird flu was found in the northwestern region of Ningxia. bird flu prevention measures During the outbreaks of bird flu between October 2005 and January 2006 thousands of teams on motorcycles fanned out across China, going from village to village and house to house, vaccinating chickens, geese and ducks for bird flu. Each team handled about 600 birds a day. The goal of the nationwide effort was to innoculate all of China’s 14.2 billion domesticated birds. Nearly a million officials and soldiers were mobilized in Liaoning Province alone. The government is worried about migratory workers from the countryside bringing the disease to the cities.